Cool Tools: Miles or buy? 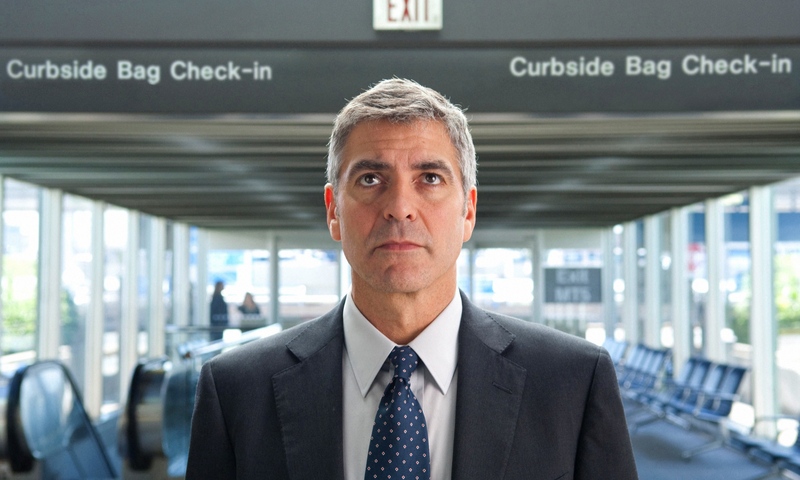 George Clooney's character collects 10 million miles in "Up In the Air"
My friend John was debating on Facebook whether he and his partner should spend $200 each on a plane ticket or 12.5K miles for a flight from Chicago to San Francisco. Lots of opinions came in, mostly – “no! spend the money! the miles aren’t worth it unless you’re traveling” overseas, more than five hours, etc. It’s a constant debate: is it worth $200, or $300, or shell out your miles? $300 is still a good chunk of money, and if you’re flying with someone else as John is, it’s $600 for two of you. A single flight in the 48 states is 25,000 miles, and a ticket is usually around $300 or less except maybe around holidays and hard-to-get places. I always save my miles for overseas flights, but those can add up: the Caribbean in high holiday season (like between Christmas and New Year’s) is 60,000 miles, but any other time, even February, is only 35,000. Same with Hawaii. Europe can sometimes be as low as 40,000 miles depending on when you fly, but normally you have to budget aroune 60,000, or $800. John pointed me to a cool tool: “Miles or Buy” (though slightly outdated – it lists now-defunct Northwest Airlines) that will help you decide whether you should buy a ticket or trade in your miles. It is sort of like a “Pick your Own Adventure!” book, in that it guides you through your entire flight purchase decision from where you’d like to travel all the way to helping you search for the ticket price on Kayak. The most useful portion of the tool, however, is this calculator which determines the CPM (cents per mile) of a ticket and whether it’s worth buying the fare or trading in miles. Protecting your valuables on the beach is always a tricky deal: you want to bring your Ipod, your phone, your camera, plus your money and keys, but then one of your friends or family has to stay behind to guard everything while everyone else runs off. Or, you just take a deep breath and against all better judgement, hide your valuables under the oh-so-secure beach towel and “keep an eye” on it while you’re in the water. That’s relaxing, isn’t it? Some options for this summer’s beach time. Reef, the maker of many a brown leather flip-flop worn by yuppie men 30 and under, has come up with an ingenious hiding place for the items of your wallet. 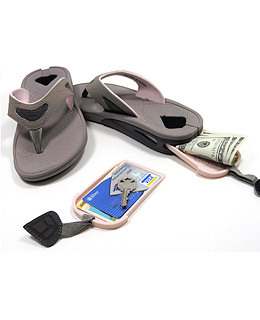 Possibly inspired by the Shoe Bomber, the Reef Stash Sandals can hold your cash, credit card, room key, and other small, flat items right inside itself. Cool? Dude. Drawbacks: It only holds that amount of stuff. Your camera, watch, Blackberry, and other items you probably should have left behind because, after all, you’re on vacation, won’t fit in that shoe. In addition, since they’re not securely strapped to your feet, you do run the risk of having the ocean waves wash your shoe away. Insist on vacationing with your Blackberry on and your watch set to the right time zone, and your phone poised and ready in case your boss calls? You should just go home. But if you won’t, you can option to strap this Day Pak drybag around your waist. The bag is waterproof and air-tight, so no water can get in (theoretically). Jon and I do own one of these but I think we still got too nervous about putting our camera inside (we opted to hide it in a better place, under that secure towel or maybe even a book). If you want to try, seal your items in a zip-loc bag first, then into this bag for double security. This bag is also large enough to hold your passports as well, if necessary. Sure, you might look geeky in the photos, but at least you still had your camera available to take the pictures. If you’re one of the thousands of travelers stranded because Iceland, a country named for being very icy, had a volcanic eruption spewing fire and ash into the skies and making visibility and flying conditions unsafe, then you must be enjoying the long queues trying to get a rail ticket, a rental car, a hotel, a cup of coffe, anything until the skies clear and you can continue your journey wherever you’re headed. I have no good advice to offer, other than, this is life! Life is an unpredictable trip, and that’s what makes it so exciting. Think of all the stories you have from this experience. Even now, people in Baltimore and DC still talk about the February snowstorms that rendered the federal government useless and closed for a whole week. I am one who tends to enjoy natural disasters (as long as people don’t get hurt). There is something so fascinating about having your daily life shaken up, altered, uncontrolled, and there is absolutely nothing you can do about it. Or is there? Forget complaining or trying to get back to your normal life – it isn’t happening right away. Instead, be original with your newfound time. No matter where you’re stuck far from home, I’m sure there is something interesting you’ve wanted to see that you didn’t have time before. Now’s the time to take advantage. Go treat yourself to a delicious meal, or see a new museum, or participate in a new event happening in town. Sleep in a hostel! What’s the worst that could happen to you? By far, this will be one of your most memorable experiences. Take pictures. Write it down. Share it with friends and family. Tell it to your grandchildren. Life! It’s a trip, isn’t it? It’s tough to maintain a blog, a job, freelance work, a house and a hobbling husband with a healing incision up his abdomen, so I apologize for the halt in blog posts. However, it doesn’t mean my mind hasn’t been churning with ideas recently, so here is one that’s been sticking with me these days: destinations my children (and I) may never get to see. Thanks to floods, earthquakes, pollution, global warming, overpopulation, over development and lack of money, we have to slowly say good-bye to some of the world’s greatest sites. 1. Glaciers of Europe, including my beloved Alps, where I picked wildflowers to wear in my hair, and Chamonix in France, where I’ve dreamt of going skiing when I have loads of euros. Talk about the hills being alive. Not for long. 2. 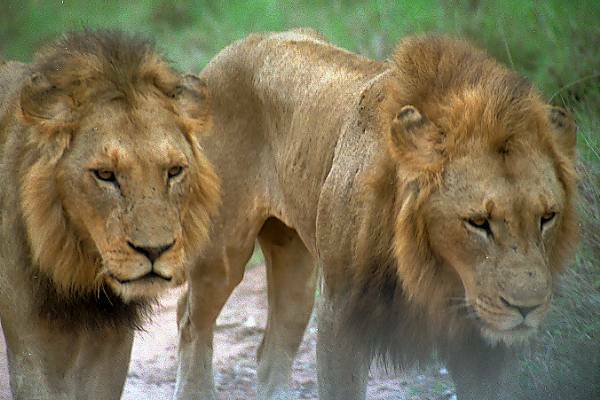 Africa’s lion population. This is partly why I’m trying to jet off to southern Africa this year. The lions are vanishing. 3. Central America’s Cloud Forest. Fortunately, we experienced this last year in Monteverde, Costa Rica, where we took a night tour of the jungle and then zip-lined through the canopy in the morning. It was worth it. 4. Orangutans of Borneo. I took Primate Ecology in college and got an A; orangs are interesting creatures and close relatives of ours. To see them go extinct because of human mistake is a sure shame. 5. Florida Everglades. It’s so close to home, yet we skip away to foreign lands. Go soon before more old people turn it into retirement communities. 6. The Taj Mahal. 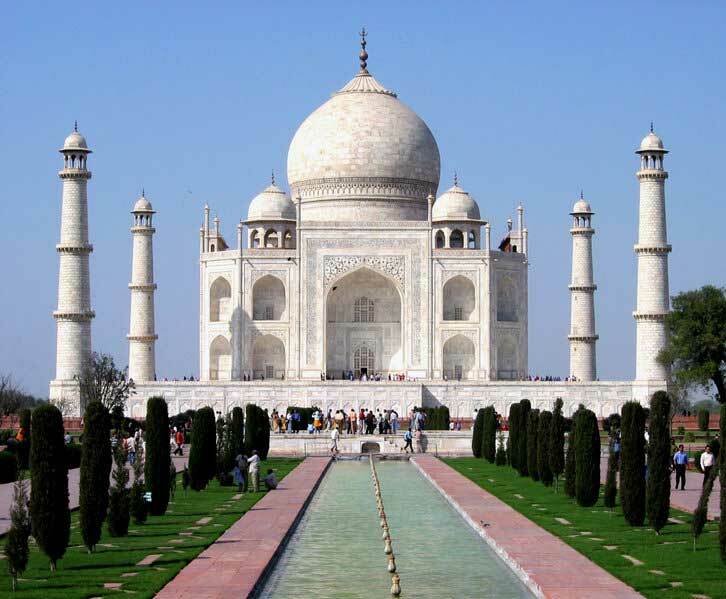 Another that I was fortunate to visit in 2007; its white marble is threatened by India’s pollution. Already you have to take a separate pollution-free bus to the site and wear booties on your shoes to walk around. 7. Arctic polar bears. A quick ride up into the Great White Northern state of Canada will let you romp around with these creatures, before their glaciers melt away and they all drown. 8. 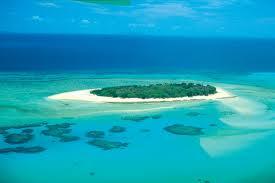 Great Barrier Reef of Australia. Sure, I tried to get the Best Job In the World but the tourism office of the Great Barrier Reef seleted some British bloke instead. However, that doesn’t mean it didn’t pique my interest to check out the diverse underwater life before it died thanks to warming temperatures. 9. The Atchafalaya Basin in Louisiana. The Atchafawhata? Apparently, a coastal salt marsh with your personal romantic view of a bayou, except it’s disappearing quickly because of flood control and deforestation. It’s another quick hop from New Orleans, so take advantage. 10. Kilimanjaro. I’ve already talked about my desire to climb this wonder, and if I don’t do it soon, I won’t get another chance. By 2020, the snows at the top will be gone, and who knows what dangers will lie when the mountain starts mudsliding and dropping boulders left and right on the tourists, as it already did.